A benefit (or challenge) of being in a book club is that book selections are not always ones that I would choose, though they are often ones that I am glad to have read. Such is the case with The Golem and the Jinni. A story filled with fantasy, yet steeped in religion and reality. I was expecting to be entertained by a cast of wizards and mythical creatures (definitely not my thing), but instead, I was mesmerized by Helene Wecker’s ability to blend Yiddish and Middle Eastern literature, historical fiction, and mysticism into a compelling and unconventional love story. While at first I had no clue what a golem was (a being created from stone or clay, according to Jewish lore), and had no interest in jinnies (otherwise known as genies … from the iconic magic lamp), barely into the story, I actually forgot that these two main characters were not real; that is, human. Maybe that’s a good thing. Too often I get fixated on fact and refuse to let my imagination run free; too willing to stay within my comfort zone. 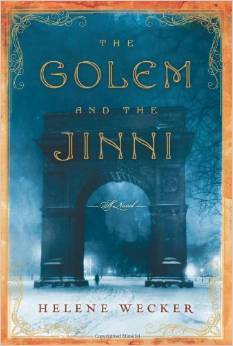 The Golem and the Jinni was definitely a departure for me … almost like taking a little vacation from reality, from myself. It was a lot of fun.